The first day in Arequipa found the five of us - the aussies, the Bedfords and yours truly - opting to go on a masochistic excursion to the Colca Canyon, which included waking up at 2 in the morning and ascending 2400m along a bumpy road. My body reacted violently to the sudden elevation change and by the time we reached our breakfast stop, I had managed to get rid of my previous night's dinner and half of my body fluids in three attempts. The famous coca tea, which I drank by the gallon, managed to convince my body that the world was not coming to an end. 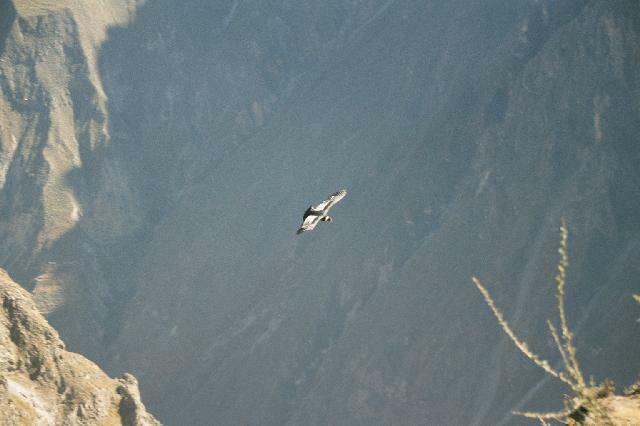 The primary reason for all the effort was to make it to the canyon, which by the way is the deepest in the world, by early morning to see the the flight of the Andean Condors, which by the way is the largest flying bird in the world. The condors rise from the canyon floor with the thermals and we were lucky to see a half a dozen of them that morning. 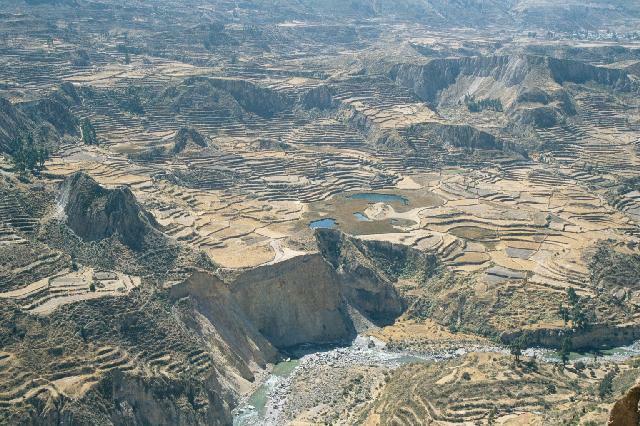 The canyon was completely covered by many pre-Inca terraces where cultivation is carried on even today. There were some 11th century stone plans of the terraces showing the major aqueducts which irrigate the region. Needless to add, these plans were fairly accurate even today. We also saw the famous hanging tombs of Choquetica, named so because the people used to hang from top of the cliffs to build them and hence the only way to reach them is also from the top! On the way back, we stopped at the high pass, the Patapampa pass which is at an elevation of 4800m and also at various other points to watch herds of grazing llamas, alpacas and the rarer vicunas. During one of the pit stops, we had a llama entering our van and going for our food pack. When I tried to pull the food away, the llama started using its secret weapon : the spit. In order to save us some washing, we fed the llama all of the sugar puffs that Juliet had bought the previous day. We were later informed by the guide that these puffs were known as the Peruvian Viagra. Well, in case there is a sudden explosion of llama population in Peru, you know whom to blame! 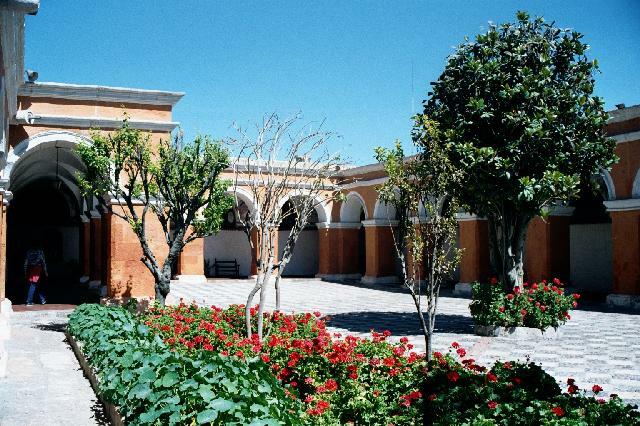 I spent most of the next day exploring the city of Arequipa on my own. Arequipa is a typical colonial city and easily the most beautiful city I have seen so far. It sits in a very pretty valley with the snow covered Andean peaks looking down on it. The best views of the city can be got from the Yanahuasa and Sachaca view points. Unfortunately, the main cathedral had lost one of its towers in the earthquake and had to be closed to the public. The biggest attraction in the city is Juanita, a 15th century mummy of a 14 year old Inca girl sacrificed on the high slopes of the Ampata mountain. She along with the many gold, silver and copper figurines (offered for the sun, moon and the earth respectively) were on display in the Museo de Santuarios Andinos. It was a really interesting to see the well preserved mummy, although some of us, especially Mike, thought it was a great disrespect to her and her culture to keep her on public display. Santa Catalina monastery, located right opposite to the museum, was my next stop. This extremely picturesque monastery has been housing nuns from the 16th century and part of the monastery has now been made opened to the public. Before heading off to the next destination, I did have some time to visit the San Francisco museum and some of its really pretty religious paintings - the last supper being the pick of the lot - from the Cusco school of art. That evening, a 30 minute flight took us from Arequipa to Juliaca and the Peruvian altiplano. By dusk we reached Puno, a city situated on the banks of Lake Titicaca. Lake Titicaca covers 8000 sqkm and lies across the border of Peru and Bolivia. Although there are lakes higher than it that can be crossed using small boats, Lake Titicaca (elev. : 3856m) is marketed as the highest navigable lake in the world as it allows larger boats to traverse it. Titicaca is also the site of the mythical origins of the Inca empire. The first Inca, Manco Capac, and his sister Mama Occlo, the children of Wiracocha, appeared on the islands of the sun and the moon located within the boundaries of present day Bolivia. In the morning, we took a boat to the Tequile island, the largest island on Titicaca on the Peruvian side. On the way, we stopped at some of the floating man made reed islands inhabited by the Uros people. The fear of the Spanish had forced these people to live on these islands and the money from the tourists is still keeping them there. There are about 15 such islands on Titicaca. It was an unique experience to walk on these islands that felt like one big soft leaky cushion! 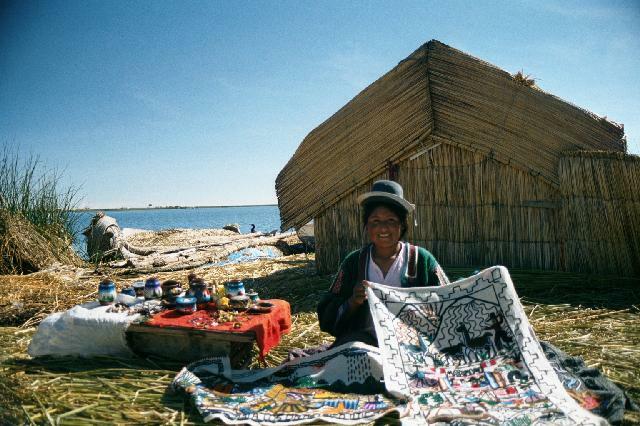 Tapestries made by these Uros Indians are very attractive and almost every tourist who lands here ends up buying one. Tequile island, named after the Spanish conqueror Pedro Gonzales de Tequile, is a mini country on its own. People here have their own rules and dress code and in order to live on the island, an outsider must marry a local and also be accepted by the community. Hotels are banned on this island and all tourists end up staying as paying guests in one of the local houses. It was here that I was first introduced to Qinwa, a local cereal and Munya, a substitute for the coca tea. Being a vegetarian, I found Qinwa at least once a day on my menu throughout my stay on the Andes. That evening we walked up to the highest point on the island (4050m) to see a fantastic sunset. The deep blue waters of Titicaca with the snow covered Cordillera Real (the royal chain of mountains) on the background captivated all of us and we saw more of it the following day, when we walked up, down, through and around the island. By then the altitude sickness, which I had managed to lose up the Kilimanjaro, somehow tracked me down on top of Tequile. At this point the travelogue would have turned on its head if not for Julian taking over as my doctor and Juliet as my nurse. Julian's magic tablets combined with Juliet's continuous strict monitoring of my fluid intake saved my day, and my holiday. Outside the altitude, the only other thing which troubled me was the menu - it always had only two items on it: potato omelette and/or fish! On the way back from Titicaca, we spent an hour in the town of Chiquito visiting its fertility temple and cleaning up all the finger puppets from the local market. 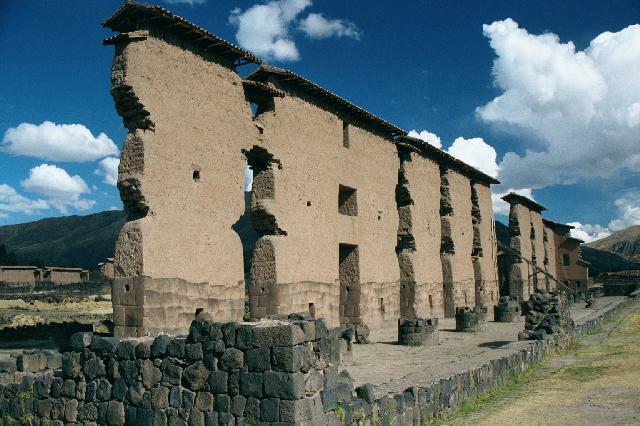 Chiquito, once the capital of Aymaras and the Spanish, today is a ghost town having lost most of its people to more lucrative Puno. The drive from Puno to Cusco took us through some fantastic Andean scenery and having driven through the desert a few days ago, it was hard for me to believe that we were in the same country! Our first stop was at the tombs of Sillustani. Sillustani, which means finger shaped, is a peninsula in the Umayu lake - a lake which was once a part of the Titicaca lake. The tombs here were built by the Colyas who later became the part of the Inca empire. Newer tombs hence have a distinct Incan influence. Looking at the entrances, people think that these tombs were built by midgets. The Colyas along with the Tiahuanacos and the Lampacas formed the three major pre-Incan civilisation of the altiplano. Of these, the Lampacas were the most aggressive and were not conquered completely either by the Incas or by the Spanish. Close to our destination, we had another stop, this time at the ruins of Raqchi. It was our first sight of a big Incan ruin. Raqchi used be the store house of the grains and the food used to be distributed to the war affected zones and the drought affected zones from here. The place had big granaries and even bigger temple dedicated to Wiracocha, the father of the sun, the moon and the earth. Click here for more photos from Arequipa and the Colca canyon. Click here for more photos from Lake Titicaca.